This is the thirteenth episode of the stories of Mahabharata. We have progressed quite a bit, but we have a long way to go. In this episode we hear couple of fascinating stories. 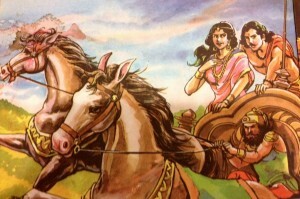 In the first story, Arjuna rescues the five Apsaras from their curse. And in the second story, Ajuna falls in love with Krishna’s sister Subhadra, and at Krishna’s suggestion, he forcefully abducts Subhadra and finally marries her. Listen to the episode and let us know how you like it. Visit our Facebook page (facebook.com/MahabharataPodcast) and join the discussion.